Two months ago, commenting about the uncontained engine failure involving the Qantas B747-400 just departed from San Francisco (for details read here) I wrote: “Unlike other minor failures occuring almost daily everywhere, an uncontained failure (that is quite different from an engine explosion…. ), is somehow rare, but not a big deal (if there’s no damage to the wing or fuselage caused by a separated engine part), especially if happening in the vicinity of the departure airport”. What happened to QF32, an Airbus A380 from Singapore to Sydney somehow prov e that such kind of emergency is not as rare at least for Qantas aircraft…. 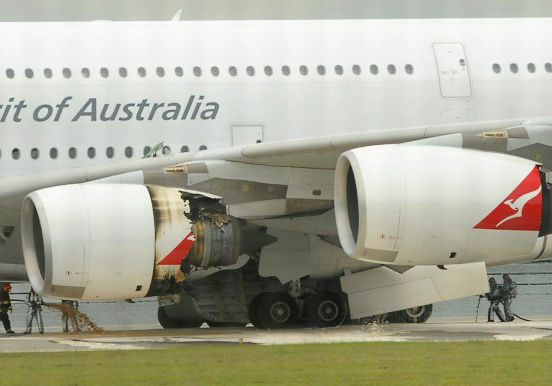 On Nov. 4, 2010, Airbus 380 “VH-OQA”, the first A380-800 flying with Qantas, with 433 passengers and 26 crew members on board, experienced an uncontained engine failure 30 minutes after departure from Singapore and was compelled to return to Changi airport where it performed a successful emergency landing after circling above the sea for fuel dumping. Parts from the #2 engine punctured the left wing while debris fell on the ground (fortunately, nobody was hurt). Even if the cause of the failure is obviously still unknown, as a consequence of the engine problem Qantas grounded its seven Airbus 380s, to be followed, according to rumors, by the Singapore and Lufthansa ones in the next few h ours (Qantas, Singarpore and Lufthansa A380s are equipped with the Rolls Royce Trent 900 variant power plant – while Air France and Emirates are powered by Engine Alliance GP7200 engines). Since I’ve not heard latelyabout similar events involving aircraft of other airlines, what happened to QF32 raises a question: what’s wrong in the Rolls Royce – Qantas duo? Perhaps nothing. Perhaps Qantas planes with Rolls Royce engines had just bad luck but investigation will have to analyse also airline’s maintenance procedures as well as engine design and type of material used to build engine components at RR. So, what have we learnt so far from this event? F-35, STOVL, Joint Force: will Italy follow the British path?